This article is about Joe Cada, winner of the 2009 world series. Joe Cada made his name in poker by winning the 2009 World Series of Poker main event at the Rio hotel-casino in Las Vegas. Cada has established a reputation as one of poker’s most personable and intelligent stars as well as one of the game’s leading tournament players. Cada was born on November 18, 1987, in Shelby Charter Township, Michigan, approximately 30 miles north of Detroit. He resides in nearby Chesterfield Township, Michigan, and he has said he is considering purchasing a second home in Las Vegas. Cada plays online poker at several sites using the screen nicknames jcada99 and JCADA99, obvious takeoffs on his real name. Cada is sponsored by the online site PokerStars. Cada comes from a family of card players, but he made his first serious venture into competitive poker in 2003 when he set up an online poker account with his brother Jerome. The brothers ran up an initial deposit of $25 to $250 before Joe lost the entire bankroll in one night. Cada began legally playing casino poker at the age of 19 in Windsor, Ontario, Canada, across the river from Detroit. Cada had compiled a total of $9,215,654 in poker tournament winnings as of March 2011, with five major tournament titles and 34 cashes in major tournaments. Of the total winnings, $8,546,435 came from his first-place finish in the 2009 World Series of Poker championship event. 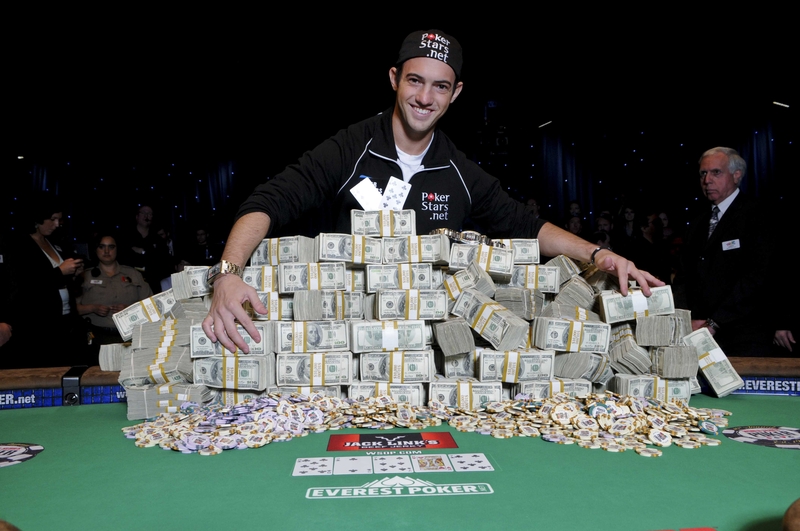 Cada finished atop of field of 6,494 entrants to win the 2009 World Series of Poker main event. Each player paid $10,000 to enter the tournament, in which no-limit Texas hold ‘em is played throughout the event. At the final table of the tournament, Cada participated in several memorable hands, including two in which he went all-in before the flop with a pocket pair only to find he was up against his opponent’s higher pocket pair. In the first of these key hands, Cada held pocket 3s against pocket jacks, and in the second he had pocket 2s against pocket queens. Each time, Cada hit a “set,” or three of a kind, on the flop and held on to win the hand. When the final table had been pared to the final two players, Cada had a chip lead of $135 million in tournament chips to the $58 million in tournament chips held by his opponent, Darvin Moon. The heads-up portion of the tournament lasted 88 hands. On the final hand, Cada’s pocket 9s held up against Moon’s queen-jack of diamonds. At age 21, Cada became the youngest player to win the World Series main event. Two months before his World Series victory, Cada had earned $128,872 by winning an online no-limit hold ‘em tournament on PokerStars that carried a $1,050 entry. Cada has had several other major scores besides his World Series championship. In January 2008 he won an online tournament at Full Tilt Poker for $147,488. In January 2010 he placed 11th in the PokerStars Caribbean Adventure High Roller Championship for $51,450. In October 2008 Cada won $49,590 by winning a Full Tilt tournament, and in July 2009 he placed second in another Full Tilt event for $45,221. Cada invites more than a dozen friends to his house on Sundays, where they all compete in online poker tournaments. The November 9 WSOP main event final is well under way.